The Serving Pets Outreach Team (SPOT) is dedicated to helping our Brown County community provide responsible care for their pets. 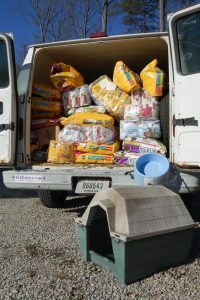 The mission of the SPOT program is to reduce the number of unwanted animals in the country and to keep loved pets in their homes and out of the shelter. Call the SPOT team at 812-703-0797 for assistance with any of the following services. Low-Cost Spay/Neuter – SPOT provides low-cost spay/neuter assistance for Brown County cats and dogs. In addition, several specials are held through out the year, reducing the cost even further. Get more information on how this program works. Temporary Pet Food Assistance – If your family is having a difficult time affording pet food, we can help. Pet Supplies – SPOT often has collars, leashes, runner lines, food and water bowls and other pet supplies available for families that need them. We are delighted to provide these items to cats and dogs as long as we have them. Pet Housing – In the fall and winter SPOT volunteers can deliver bales of straw to outdoor dogs and cats to help keep them warm. We also have gently used dog houses available for outdoor dogs and can provide warm housing for outdoor cats also. Enclosures to get dogs off of chains – SPOT may be able to provide fencing and labor to help construct pens to get dogs off chains. The dog owner is asked to help with construction, if possible. This service is reserved only for those dogs that are on chains 24/7. 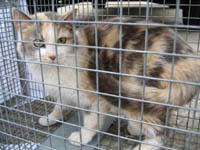 Trap-Neuter-Return (TNR) for feral cats – SPOT can provide traps and assist with catching feral cats to get them spayed and neutered. Cats will be returned to their original location and will need caregivers to oversee the colony. 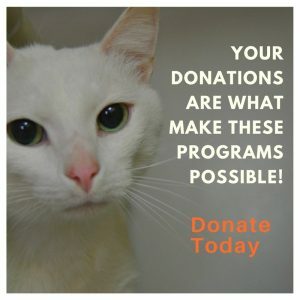 Learn more about TNR and why it is the most humane and most successful way to reduce the population of feral cats.